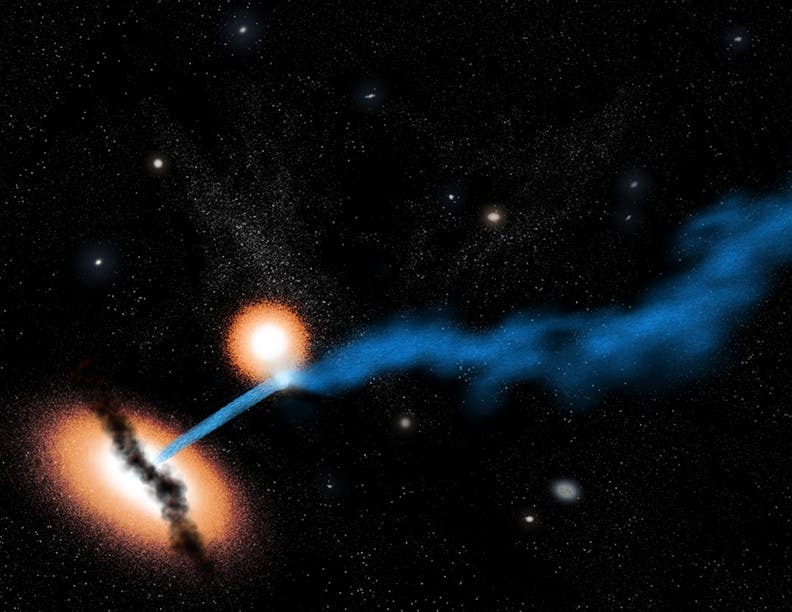 The supermassive black hole at the center of a distant galaxy is blasting a smaller neighbor with a violent energy jet—earning it the Star Trekky moniker, the "Death Star" galaxy, one of two galaxies orbiting each other at an unusually close distance. The pair is located in the constellation Serpens about 1.4 billion light-years from Earth. The jet may also lead to a new burst of star and planet formation. "The origin, propagation, and energy dissipation of jets are among the most important unsolved problems in modern astrophysics," said lead study author Daniel Evans of Harvard University in Cambridge, Massachusetts. Jets may hold also vital clues to figuring out how energy was transported in the formative stages of the universe, he added. The galaxies were found using some of science's most powerful technology: NASA's Chandra X-Ray Observatory, the NASA/ESA Hubble Space Telescope, the National Radio Astronomy Observatory's Very Large Array, and the U.K.'s MERLIN array of radio telescopes. The images show a jet reaching out like a tentacle from the larger galaxy—which is about the size of the Milky Way—about a million light-years into space. About 20,000 light-years along the way, the jet encounters the smaller galaxy. That galaxy—which is also thought to harbor a supermassive black hole—has swung itself into the path of the jet and is rotating clockwise toward it. Collisions between nearby galaxies are relatively common in the universe. Black hole jets are less common, though scientists have detected many of them. But both at the same time had been unheard of until now. "The difference is that one of the two galaxies is ejecting the relativistic jet—and to have it crash into the side of the other galaxy is a really rare occurrence," Evans said.